Bird Ready(TM) is a brand of quality wild bird seed, mealworms, and unique products tailored to the backyard birdwatching community. We are owned by The Best Nest of Georgia, Inc. which also owns a local Wild Bird Center and is the manufacturer of the Sugar Shaker Nectar Maker(R) the fastest & easiest way to make hummingbird nectar without boiling the water. We’ve always wanted to create some form of a local and national community giveback program. We knew we wanted to work with seniors in need and we knew we wanted to bring some joy to their lives. Our Friends 4 Seniors(TM) program was created to allow seniors a chance to view the wonders of nature up-close and everyday. Bird Ready(TM) is partnering with local non profit senior organizations to bring smiles to the faces of every senior citizen we can reach. 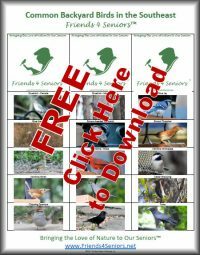 Our Friends 4 Seniors(TM) goal is to bring nature’s beautiful & wonderful wild birds to the backyards of every senior possible. Backyard bird watching is tremendous fun for all ages. It is especially rewarding for seniors in that it stimulates the mind and keeps our seniors citizens active, happy, and alert. Imagine your Mom or Dad spending hours identifying Cardinals, Titmouse, Chickadees, Bluebirds, and many more wild birds coming right into their backyards. Nature has a calming effect on all of us, bringing the wild birds right to their backyards will give them hours of enjoyment each day! Now imagine a senior citizen in need, not having a lot of family around, or worse completely shut in. These seniors could probably use a little joy in their lives and Friends 4 Seniors(TM) hopes to provide that joy by bringing wild birds into their lives. Bird Ready(TM), local wild bird stores, and local senior organizations are teaming up to give away one of Bird Ready’s (TM) hopper styled bird feeder and a pound of wild bird seed to a senior in need for every 3 feeders sold in the local wild bird stores or online. This quality wild bird hopper feeder is made of metal, beautifully painted with a top that makes loading the seed easy, and drain holes in the bottom to allow water to pass through. This unit will last for years and can give your family members hours of enjoyment each day. 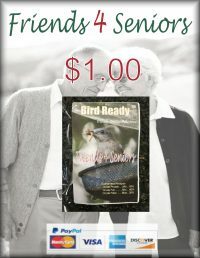 Bird Ready(TM) needs your help in promoting this to our seniors across the country. We are trying to focus on seniors who are practically shut in, known not to have a lot of family close by, or just in need for a wild bird friend to visit everyday. 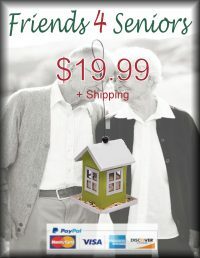 If you are a senior care service that might like to participate in the Friends 4 Seniors(TM) program please click on the link here and leave us your information. If you would like to participate by purchasing one of our beautiful wild bird feeders click on the Amazon button below. We will donate 1 wild bird feeder & 1 lb. of black oil sunflower to a senior in need for every 3 feeders that are sold! Thank you for your contribution!! We are also taking donations to provide additional wild bird seed for the seniors in need. A 1 lb. prepackage bag of Bird Ready(TM) black oil sunflower is just $1. One pound of black oil wild bird seed will fill this particular feeder about three times. Thank you for your contribution to our program. Click below to purchase your gift through PayPal. If you would like to purchase the entire kit for $29.99 you can get that on Amazon by clicking here!